Freetown, Sierra Leone during the Ebola outbreak. I remember reading the 1995 bestselling book The Hot Zone in college as a biology major and budding researcher, and being haunted by the visceral descriptions of the gory deaths that highly infectious diseases like Ebola bring on their victims. So when an Ebola epidemic swept through West Africa in 2014–2016, resulting in the deaths of more than 11,000 people, I was gripped by the absorbing stories that were being reported from the ground by journalists like Amy Maxmen, who wrote more than 15 pieces on Ebola from Sierra Leone—ground zero for the epidemic—for outlets like National Geographic, The Economist, and Newsweek. We journalists often long to put ourselves in such intense reporting situations, because this type of shoe-leather journalism brings us closer to understanding our world, our sources, and our humanity. In a time of dwindling budgets, with fewer and fewer publications subsidizing reporting trips, Maxmen’s opportunity (through a grant from the Pulitzer Center on Crisis Reporting) to travel to the region during the height of the Ebola epidemic was rare and enviable. The desire to report from the field on important, human-driven stories is the reason many of us became journalists. Maxmen took three trips to Sierra Leone, extending her first stay from 10 days to a month over the holidays because she was so moved by the number of important stories that she felt needed to be told. She recalls emailing her editors in the States on Christmas Eve with urgency about news that she thought needed to be covered and feeling annoyed when they didn’t immediately reply. “Where I was, nobody was talking about Christmas,” she told me. Maxmen’s story on burial rituals, one of a series of Ebola pieces she wrote for National Geographic, puts a human face on the cultural crisis that faced many in West Africa as the outbreak raged on. It is an uncommon luxury to spend time teasing apart an award-winning story to glimpse insights into what makes the piece impactful and impossible to put down. Maxmen is a masterful narrator, using vivid storytelling in subtle ways to put us right into the unimaginably sad circumstances she encountered. Below is an annotated version of Maxmen’s story, which reflects what I learned as I peeled back the layers. Read on for my conversation with Maxmen, who shares the backstory behind her reporting in West Africa and the lessons that have shaped how she approaches her work. To stop infected bodies from spreading the disease in Sierra Leone, health officials persuaded local leaders to change how villagers mourned. FREETOWN, SIERRA LEONE A great quarrel followed the death of a pregnant Guinean woman in June.Ledes can sometimes feel formulaic or overwrought in detail. For instance, they can have too much of that predictable “It was a dark and stormy night” feel, or they can feel too indulgent, luxuriating for too long in cinematic detail when the reader just wants to get to the point. But this opening sentence immediately grabs our interest without being wordy or contrived. The brevity has a punctuated feel that is impactful. And the phrase “A great quarrel” captures such depth and intensity, as if we’re about to sit back in a comfortable chair and hear an ancient tale. It also immediately establishes the enormity and gravity of the situation at hand; we would never write, “A great quarrel followed my husband’s decision to leave his socks on the floor—again.” Mourners refused to allow a team of outsiders dressed in what looked like white space suits to bury her Ebola-infected corpse. If she was to be saved from eternal wandering and reach the village of the dead, they insisted, her fetus must be removed. Impossible, the outsiders said.Maxmen is artful with her use of short sentences, which make for pleasing changes in rhythm. These four short words convey a great deal without bogging the story down in quotes and longwinded explanation. Her virus-laden blood was far too contagious for anyone to cut into her body.Maxmen takes us straight to the heart of the story in the first couple of paragraphs. It’s a refreshing way into the narrative; in contrast to the common anecdotal lede, which can sometimes take longer to tell readers what the central tension of the piece is, we get a glimpse at the tension and complexity of the story right up front. In two brisk paragraphs, Maxmen hooks us on the conflict behind this heartbreaking situation and gives us a light dose of the biology behind the virus. This is a model lede. Yet the villagers would not relent. In their traditional Kissi culture, a woman buried with her fetus disturbs the world’s natural cycles—beginnings and endings among humans, animals, and plants. 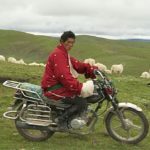 In the same way, it is said, mixing the seeds of last year’s harvest with this year’s complicates the fertility of the crop, as well as the fertility of women. Even if the surgery was as dangerous as the outsiders suggested, the villagers worried that the results of disrupted natural cycles could be worse.Only three paragraphs in, readers already know that this is so much more than a story about infectious disease; this is about people, culture, tradition, spiritual belief, and more. And we begin to understand how much is at stake—it’s not solely the individual and cultural beliefs of the people in the region that are being threatened, but a people’s entire set of values and origin stories, and their livelihoods. Maxmen’s writing is so fluid and vivid that it’s easy to miss that she’s not describing a scene that happened while she was there; it occurred several months earlier. 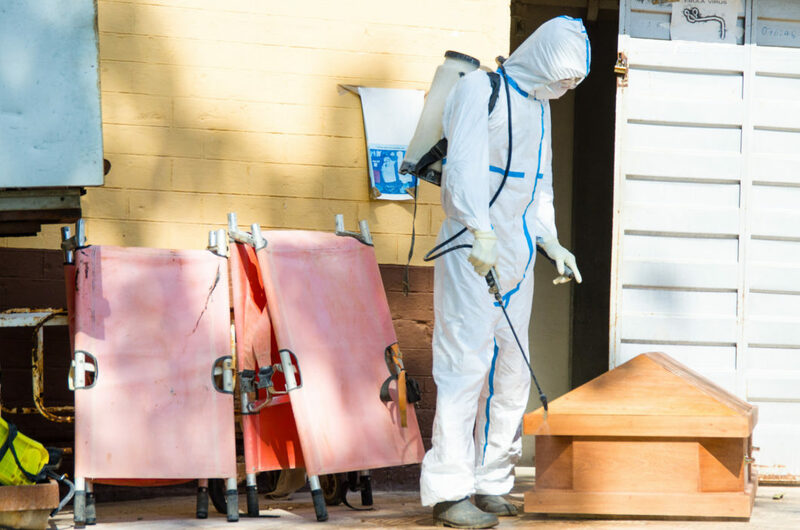 A burial worker sprays chlorine on a casket. Exasperated, the district medical officerJust the use of this one word—“exasperated”—breathes humanity into the officer’s character and puts us there, almost. It also gives us a window into the tension between the cultural concerns of the locals and the very real medical emergency that health workers were facing. called an anthropologist originally from Cameroon to help him find a solution. From decades of experience in West Africa, Julienne Anoko knew there must be ways to make reparations to the spirits for ceremonies that could not be performed as tradition demanded.This introduces a protagonist and throws in an element of surprise—a researcher who is straddling these two worlds, from academia to full immersion in the cultural milieu of this region. The introduction of Anoko here helps keep the reader reading. And by alluding to the unresolved idea that “there must be ways to make reparations,” Maxmen signals that we are going to be taken on a journey. We get a real sense of dynamics high in the story—that the situation is changing rapidly. This piece already has all the elements of story, and we’re only a few paragraphs in. I was interested to learn in my interview with Maxmen that she had not been able to reach Anoko until very late in her writing of this piece, and that she added Anoko’s character in just before turning it in—a fortuitous addition that was key to the narrative. The villagers would need a goat, 12 yards of white tissue, salt, oil, and rice.The narration here is so subtle: We aren’t being told about these people’s cultural traditions—we’re being shown, up close. And this list is beautifully vivid and charming. A goat, of course! Anoko, who was working for the World Health Organization, provided each item, and the community accepted them.Maxmen has left out unnecessary details that would bog down the story, such as Anoko’s specific title at the WHO, and how Anoko actually learned that these were the correct ingredients—much less how she tracked them down. Maxmen keeps us anchored there in time, providing just enough detail to keep the story moving. At sunset, she watched the ceremony begin with the distribution of smooth kola nuts, symbols of respect. A world away, burial workers in sweltering hot Tyvek suits hygienically laid the pregnant woman to rest.Maxmen’s writing masterfully demonstrates the old adage about showing—through actions and scenic details—rather than telling. Brief as it is, the comparison between the sunset ceremony and the workers’ sad undertaking makes for a powerful juxtaposition. Anoko’s solution was the exception until recently. Scenes of conflict were frequent in Guinea, Sierra Leone, and Liberia—the three countries hardest hit by Ebola—Here Maxmen brings us essential context.as medical authorities tried to separate the dying and the dead from their communities.This image is so evocative and visceral—we can feel the dead and dying being torn from their loved ones. Ambulance drivers and burial teams were pelted with stones. In the worst attack, eight people distributing information about Ebola in Guinea were killed. Villagers often retreated with ill relatives into the forest, where they could hide—and where the deadly virus then quickly spread.This line helps readers understand the scope and seriousness of the problem, and how interwoven the cultural aspects are with the spread of the disease—the anthropology angle of this story isn’t simply a quaint or convenient sidebar to the disaster. “The problem was that the people handling the intervention only looked at this as a health issue; they did not try to understand the cultural aspects of the epidemic,” Anoko says.This quote is well-timed; it summarizes the conflicts that the story presents and serves as a smooth entry point into the billboard / nut graf of the story. And it gives us a human voice and a breather at the very point we need it. But Anoko and others familiar with local customs helped health officials realize that they could not curb Ebola until they found ways to accommodate deeply held beliefs about the obligations of the living to the dying and the dead. As health workers and burial teams have altered their procedures, and as political, tribal, and religious leaders pressed people to adapt their traditional ceremonies, the spread of Ebola has begun to slow.This is a classic nut graf, crafted subtly enough that it doesn’t give too much away, doesn’t slow the story, and yet telegraphs where the story will take us—to the idea that there is a direct link between respecting cultural practices and slowing the spread of the disease. 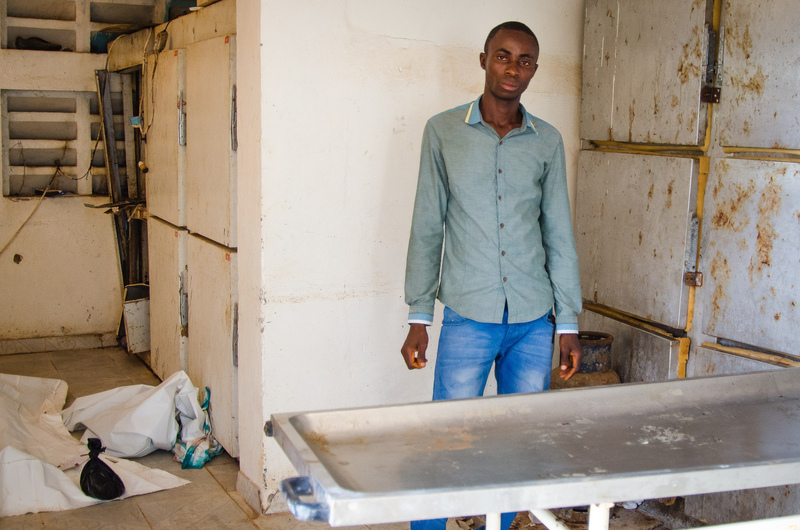 A hospital employee standing in the morgue where he prepared Ebola-infected corpses for burial. In the three countries hit hardest by Ebola, preparations for burial typically are carried out by community members who handle the dead with bare handsa staggeringly telling detail, rather than by doctors, morticians, and funeral home directors. People were unwilling to have those practices casually tossed aside. That worked in Ebola’s favor. As death approaches, virus levels peak.Ebola is personified here as a Grim Reaper of sorts, making the part about molecular biology feel personal, at our fingertips. And Maxmen’s use of short, almost choppy sentences lends cadence and suspense. Anyone who touches a droplet of sweat, blood, or saliva from someone about to die or just deceased is at high risk of contracting the disease. To health authorities, the solution was simple. With so much at stake, science eclipses religion: Risky rituals must end.Here the tension peaks—we understand how deeply held these rituals are, and how deadly and contagious the disease is. At this point in the piece, it’s almost tempting to feel hostile toward the people in space suits. If I had been editing this story, I would have liked to see the perspective of the health workers included—to understand their points of view and what it’s like to be in their shoes. But as Maxmen notes in the Q&A, their absence from the story works, in that it serves to amplify the starkness of their role as health workers who must treat the bodies of Ebola victims in a methodical, cautious, routine way. “People were expected to go from one end of the spectrum to the other; from washing the bodies by hand, dressing them, and holding elaborate ceremonies, to having a corpse in a body bag and no goodbye,” says Fiona McLysaght, the Sierra Leone country director for a humanitarian organization called Concern Worldwide.This quote sums up the conflict and is utterly heartbreaking. Spirituality runs wide and deep in Sierra Leone, Liberia, and Guinea. The population consists mainly of Christians and Muslims. Christians close the eyelids of the dead, wash and dress them. Muslims wash the dead as well, but wrap them in a white cloth. There are also rituals particular to ethnic groups—such as the Kissi, the Mende, the Sherbro, and the Kona—as well as secret societies.In one sweeping paragraph, Maxmen highlights the religions and spiritual beliefs that coexist throughout the region. This treatment provides readers with essential context. The details of tribal and secret society ceremonies are closely held, but some hints come from locals and anthropologists with regional expertise. According to anthropological accounts, the Kissi, for example, sacrifice an animal over a stone at the dead person’s tomb and then place the stone at an altar devoted to ancestors. The Sherbro may examine the body to determine whether the deceased had been a witch who caused harm. If so, the spirit must be rendered innocuous before burial, lest it cause crop failures and other misfortunes. A third layer of ritual comes in with secret societies, groups that conduct clandestine ceremonies throughout the region. Secret society leaders must be buried in a particular manner to transfer their powers to a successor. Unwilling to go into detail, Sidikie Sankoh, a youth leader in Freetown, tells me gravely, “If these rituals are not done, there are consequences.”This quote comes not a moment too soon; up until this point, we’ve only heard from experts. 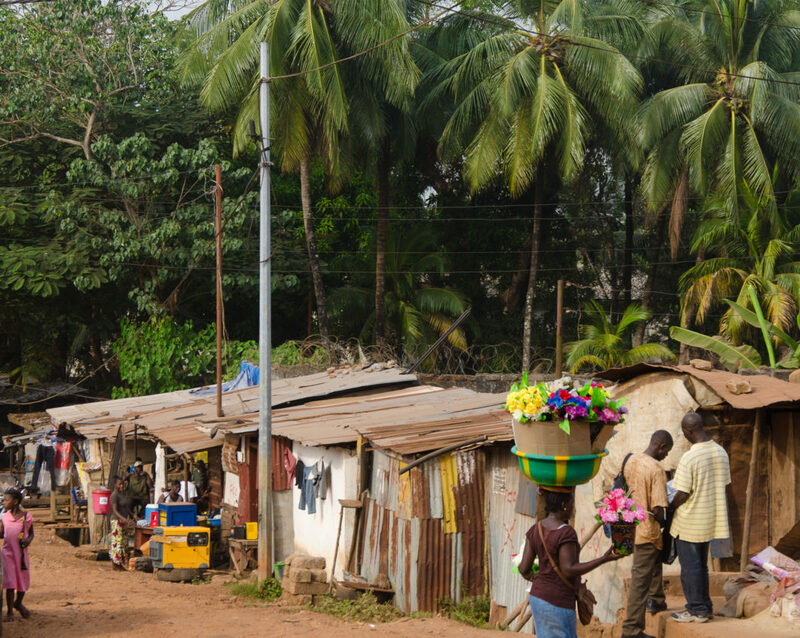 The people being affected by Ebola still feel largely distant. The quote from Sankoh conveys more than just what it says—it telegraphs how suspicious the locals likely are of outsiders, and how intimate and culturally valued their secrets are. These layers of belief mean that death in West Africa is accompanied by a complex and sacred blend of rituals. If they are ignored, the dead are thought to wander the Earth eternally and plague the community. To Westerners, the rituals ring of a forgotten past. 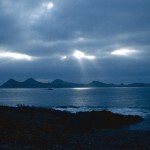 But they serve the same purpose as death rituals around the world: closure through saying goodbye to loved ones before death, and paying respect to the deceased.This sentence serves a critically important function for Western readers—it reminds us that these strange rituals aren’t so foreign, that we have our own rituals that would seem foreign to outsiders. This also serves to make the piece personal—to prompt readers to empathize and put ourselves there. Through this, Maxmen also effectively avoids the trap of characterizing West Africans as exotic to Western readers. 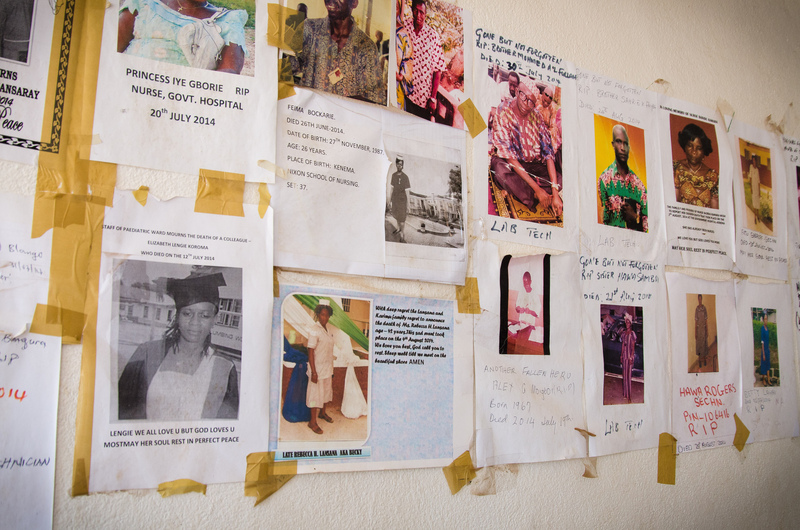 Fliers on the wall of a public hospital commemorate young nurses and lab technicians who have died of Ebola. Neither of these tenets was respected in the Ebola response until recently.This sentence gives the story immediacy—it tells readers why they’re reading it now. Throughout most of this outbreak, there were not enough beds and staff to care for the sick, so overwhelmed nurses sent the ill from one hospital to another—without keeping track of who went where. Those who died were often whisked to unmarked graves. Families were left not knowing whether their loved ones were alive or dead—and, if they were dead, where they had been buried.This information feels a touch buried in the story—it would have been helpful for the piece to nod at these issues higher up, while we are learning about the deep skepticism that the locals feel towards outsiders and authorities. These disappearances stoked conspiracy theories that Ebola was a hoax. In one, doctors were said to be killing patients to steal their organs. The less people believed that Ebola was real, the less likely they were to bring deathly ill relatives to clinics and to stop honoring their dead relatives in the traditional way.This section adds another rich layer of complexity to the story: Up until this point, the story has been about religious beliefs, rituals, and burials. Here we learn that there are other forces at play—deeper misunderstandings and misgivings. Not only are the health workers up against suspicion from the locals, they are dealing with a dangerous disease that some don’t even believe is real. 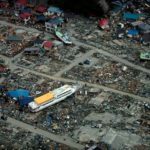 In September, October, and November, governments and international aid agencies ranted and raved about stubborn villagers.Note the smooth conceptual transitions that Maxmen uses to link the end of one paragraph to the start of another. In the preceding paragraph we learn that the villagers have deeply ingrained suspicions, in some cases for good reason; naturally, in the next paragraph, we hear that the authorities are understandably exasperated with the locals’ unwillingness to cooperate. The juxtaposition is lovely and satisfying. Meanwhile, anthropologists pressed them to understand the beliefs of the people whose attitudes they wished to change.The anthropologists, personified by Julienne Anoko and others, are the protagonists in the story, helping to mediate and bring a shift of perspective on both sides. Maxmen captures the dynamic of a changing situation, which further serves to put us there. “You have to take into account a history in which local people have learned to distrust the government,” says Paul Richards, an anthropologist at University College London who has worked in Sierra Leone for 40 years. “It’s a situation not unlike that in Ferguson, Missouri, where a legacy of slavery, exploitation, disregard, and abuse leads people to think their own solutions are better than those from the outside.”This analogy hits home in a very personal way—helping us to empathize and relate with how such deep distrust was bred. He adds, “It doesn’t help that outsiders are dressed in astronaut suits.”The space-suits visual is so stark, serving to emphasize just how alien these outsiders seem to the locals. 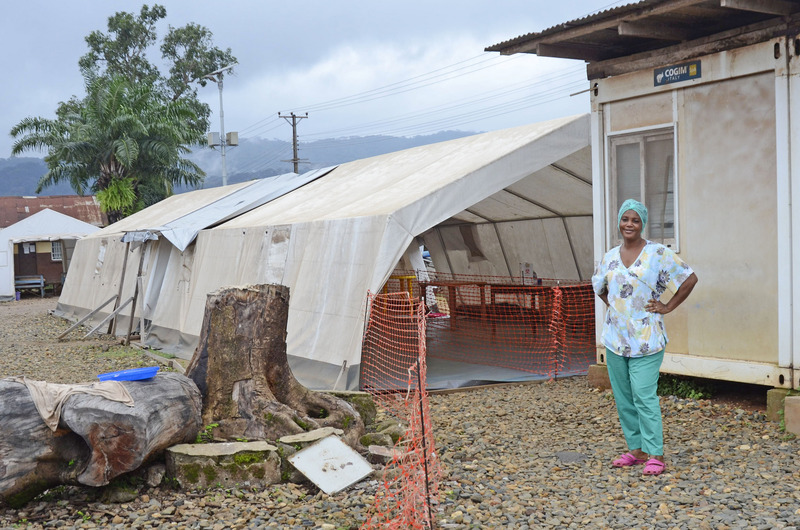 A nurse outside of a tent where patients suspected of Ebola wait to be seen. Richards knows compromises could be reached. He remembers that ceremonies were altered during Sierra Leone’s brutal “blood diamond” civil warThis provides important historical context, demonstrating a precedent for compromise and coordination between locals and health authorities. and suggests those same ceremonies might be revived now. Back then, people found ways to honor the dead they had abandoned as they fled their villages. “Burial rituals were flexible,” he says. “The spirits are totally practical!”A brilliantly charming quote that leaves us to wonder whether Richards himself feels torn between the two worlds. One hot afternoon in eastern Sierra Leone, Haille James, of the Kissi tribe, tells me what his people did when a body could not be found.This is the first time that Maxmen inserts herself in the story. Reconstructing scenic and anecdotal details to unspool a narrative when a writer isn’t present is a weighty responsibility, and it’s important to not try to “trick” readers by making it sound like we’re present when we’re not. Maxmen accomplishes this so skillfully and artfully that I was surprised—in a very good way—to realize that much of the narrative that’s woven through the story up to this point occurs prior to her December 2014 arrival in Sierra Leone. 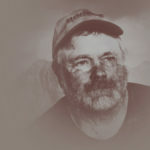 “You would go to the place where you think the person died and leave a piece of metal—four days for a man and three days for a woman,” he explains. “After that, you hold the metal on your head and bring it to your home, where you cover it. Then you can cry, bury it in a place, and pray.” Tamba Aruna, a mental health counselor in Sierra Leone and a member of the Kono tribe, says similar rituals occurred in his community during the war, only with a stone instead. Nearly five thousand people had died of Ebola by November in the three hardest hit countries, and the contagion was still rising in Sierra Leone.Here, Maxmen gives us essential statistics to show us the gravity of the situation. This could have come higher up in the piece. Organizations involved in Sierra Leone’s Ebola response claimed that 70 percent of new infections in that country stemmed from funeral rituals, although they cited no particular study.This is a staggering number, and it elicits a sense of alarm and gives us a deepening understanding of the problem’s magnitude. Erring on the side of caution, the government mandated that in Freetown, the capital city, all corpses had to be buried in body bags with sterile procedures—whether or not they were known to be infected with Ebola. Finally, officials reached out to chiefs, imams, pastors, and traditional healers for help and advice on how to change people’s minds about burials. By then, many of these community leaders needed little convincing. In Freetown, at the modest headquarters of Ahmadiyya, an Islamic sect, Munnirou Abyusuf explains how he came to believe the disease was real. Ebola could be a curse or some kind of witchcraft, he thought at first, when the outbreak began in the east of the country. But then it killed dozens of health workers, including virologist Sheik Umar Khan.Here the story comes full circle. We now learn just how rampant Ebola was, and we see a layer of the onion being peeled away. It’s no longer the locals versus the outsiders. Abyusuf consulted his holy books for guidance on how to handle burials given the danger. In The Life and Character of the Seal of Prophets, he learned of a leprosy contagion in ancient times.Maxmen’s story contains a rich plethora of cultural anthropology, infectious disease, history, and a nod to ancient prophets. And through it all, Maxmen subtly makes us feel like we are seeing it all in real time. For example, she takes us into the thought process of Abyusuf, making him feel personable and approachable, and we can almost picture him leafing through his holy books—but she does this in just a few sentences, without excess detail. New land was constantly cleared to make room for graves near this cemetery in Freetown, Sierra Leone. “When the epidemic started, the holy prophet of Islam said that people should stay put,” he says, explaining that Muhammad advocated prayers for the deceased in absentia. Abyusuf went to his congregation and explained what he had learned: “I told people, this is not the first plague. You do not need to wash the corpse. You can pray in absentia. The rules are not absolute.”Here again, Maxmen’s access to Abyusuf and his succinct, plainspoken language give this story a very intimate quality. Pastors promised their congregations similar forgiveness, and chiefs asked their people to cease all secret society rituals. Meanwhile, humanitarian organizations and the government enacted “safe and dignified burials,” during which people could pray briefly for their loved ones, while standing two meters (6.5 feet) from the white body bag.The structure of this narrative unfolds in a fairly linear way, with no fancy structural devices, because the story is impactful enough on its own. And using a chronological structure works well for this piece because it plays into Maxmen’s strategy of making readers feel present as the epidemic is unfolding and the burial rituals are changing. They also hired liaisons to discuss the precautions with mourners. The liaisons try to honor reasonable requests. In some cases, that means burial workers in Tyvek suits dress the dead in outfits chosen by families before the corpses are placed in body bags. In other cases, money or jewelry is placed in body bags as a “toll” that the deceased must pay to cross over to the village of the dead. 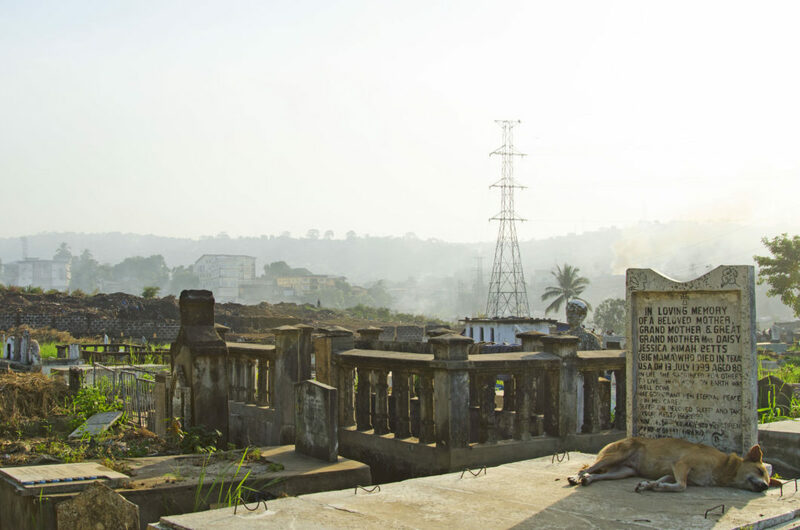 When I visited the largest cemetery in Freetown, King Tom, it was mid-December and the problems with burials had shifted.This is the first scene that Maxmen sets in the story through her own eyes. According to government statistics, almost all corpses in the Freetown area were hygienically placed in the ground by burial teams. In King Tom cemetery, about 50 bodies were planted in fresh, shallow pits each day. Dirt and hay particles hung in the humid air.This is a cinematic and sensory-filled section; we can nearly taste and feel the dirt and the hay, and the image of the freshly dug pits is so visceral. In the space of an hour, several vans rumbled over the dirt to deliver new body bags. Small groups of men and women on foot flowed into and out of the cemetery after quick prayers. They appeared bewildered by the overwhelming scene. The landscape resembled a construction site, with mounds of dirt and constant digging. A tractor at the periphery cleared piles of bramble and trash to make room for new graves. Now, the city faced a new issue: The cemetery had expanded to three times its former size and was nearly out of space. Andrew Kondoh, who had been hired by Concern Worldwide to be a liaison between burial teams and mourners, met me in the graveyard.It’s atypical, and usually inadvisable, to introduce first person so late in a story. But to my mind, the scene Maxmen describes here is so moving and personal that it works nonetheless. In fact, introducing herself into the narrative much earlier might have been intrusive, robbing readers of the opportunity to feel like they were sitting in the front row, watching the tensions play out between the locals and the authorities. There’s also an entirely practical reason why Maxmen could not have introduced first person earlier in this chronologically structured story: She wasn’t in Sierra Leone until midway through the story. His broad, easy grin belies the tragedy he’s witnessed. Kondoh counsels the young men and women who carry bodies to the morgue and graveyard. Because they handle Ebola-infected corpses, many have been evicted from their homes by frightened landlords and abandoned by their partners. “Women at the corner will not sell me water. They call us ‘Ebola people,’” one burial worker tells me. Kondoh pats him on the back, and the two chuckle at the term. Kondoh adds, “If we don’t laugh, we’ll cry.”This is a deeply moving scene. And Maxmen’s light use of humor feels touching, letting us share a bit in Kondoh’s vulnerability. 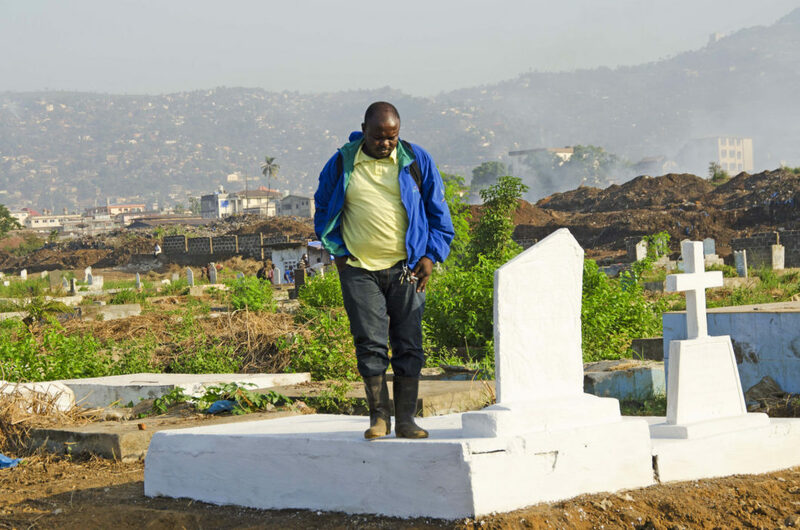 Andrew Kondoh comforted people as their loved ones were safely buried during the Ebola crisis. Ali Kamara, a burial team supervisor, says that families no longer fight with his team when they come for the dead.It’s an unorthodox choice to introduce a new source in the last paragraph. In journalism school, they might say that’s a no-no—that it can be clunky and jolting to introduce a new voice to readers as the story is coming to a close. But breaking that rule is worth it in this case, because Kamara’s quote brings the piece to such a satisfying ending, punctuating the total shift in people’s attitudes and behaviors that occurred as a result of Ebola’s devastation.“Before, people were hiding their corpses for two to three days,” while they washed the corpse and performed other rituals, Kamara says. “Now, it’s totally different. They call me at all hours and just say, take the body away.”Though Maxmen’s first-person reporting for this story took place over the month of December 2014, throughout the entire piece she deftly creates a sense of action and change, making us feel as if we’ve experienced the cultural shift that evolved over several months, and at different points for different people. This is a tricky feat, being true to a complicated timeline while also telling the story in a way that is comprehensible and engaging. In doing so here, Maxmen brings powerful, distant events to life in a way that feels immediate and accessible. Travel for this story was supported by the Pulitzer Center on Crisis Reporting. 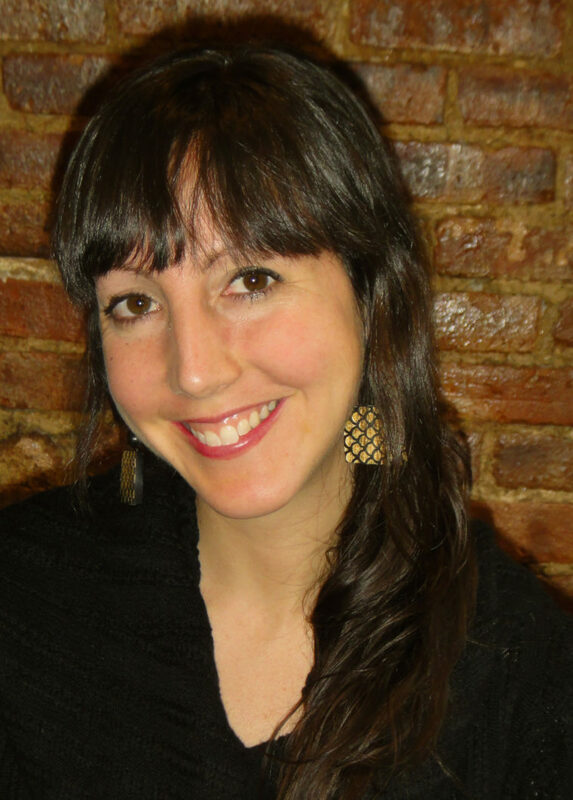 Amanda Mascarelli: What was the genesis of your reporting on Ebola, and how did the Pulitzer Center travel fellowship come about? Amy Maxmen: As the outbreak was escalating in 2014, I became increasingly obsessed with covering it on the ground. I’m very interested in infectious disease, and I had been to Sierra Leone and cared deeply about the country. When I apply for Pulitzer fellowships, I like to assure them that at least two outlets are interested in stories that stem from the travel. But that was really hard in this case. Most of the outlets I usually write for were turning my pitches down. My speculation is that it had a lot to do with liability—would they be on the hook for me if I was suspected of having Ebola, which would be really expensive. So firming up the assignments turned out to be tough, but I was desperate to go. I jumped into the reporting by writing a piece for Newsweek on how poverty, slavery, and conflict fueled the Ebola outbreak. That reporting helped me come up with other story ideas. One, about treatment made from the blood of Ebola survivors, was commissioned at The Economist in early November, and finally, on November 20, an editor at National Geographic said he was interested in a piece about how traditions around death changed as a result of Ebola. The Pulitzer Center agreed to fund my travel and I booked my ticket. Two weeks later I was there. I had expected to be gone for like 10 days. But it was so interesting. It just felt so important. And there was so much news everywhere. I extended my plane ticket twice, and I didn’t come home until January 1, so I was there for the month of December 2014, and returned for February and June 2015. Amanda Mascarelli: How did the idea of covering burial rituals evolve between you and your editors? Amy Maxmen: While I was still in New York, I talked to sources from western NGOs and agencies like the CDC who told me about how Ebola was spreading through unsafe funeral rituals. They said that Sierra Leoneans continued to bury their loved ones through traditional practices that involved a lot of touching. At least one source said that Ebola spread at one funeral because people drank water out of a corpse’s mouth. This story had attracted some media attention. So, they were hoping to encourage people to change their practices by making so-called safe burials more welcoming. When I arrived in Sierra Leone, however, I found that this wasn’t the whole story. Everyone I talked with in Sierra Leone told me they had never drunk water out of the mouth of a corpse. So it’s not impossible that this really happened, since there are a lot of traditions in the country that belong to various groups, but it was clear this story did not represent a norm. 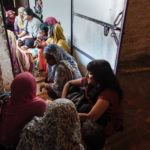 Instead, people mainly told me about how their loved ones had been taken away from them within the first six months of the outbreak. And that generated distrust that was hard to undo as the outbreak progressed. People would take their sick child to the hospital and then never hear from them again, have no idea where they were—they’re just gone. So as word of these experiences got around, people resisted burial workers because they worried about their loved ones being tossed into unmarked graves. And people were reluctant to send their family members to the hospital because they worried about not ever hearing from them again. If I had just reported this from the U.S., I would have missed this very important piece of the story. Amanda Mascarelli: What is your method for launching into your reporting when you’re planning a trip to someplace like Sierra Leone? How do you figure out who to interview and how to get around? And how much of your reporting plan is set up in advance? Amy Maxmen: Typically on these trips, I like to have enough in place so that I know what I’m doing for the first 24 hours. I know how I’m getting from the airport to the hotel, and I know who I’m visiting for an interview. I call a few translators before I leave so that I have a sense of how well they speak English and if we’re likely to get along. I also go with lists of phone numbers for sources that I’ve gotten by digging around online or in calls with experts. I’ll also have phone numbers for friends of friends. And I say that loosely. I met the paramount chief of eastern Sierra Leone through an Uber driver in Brooklyn. I’ll also have thought through sticky situations so that I can try to prevent them and have ideas on how to respond. Then, once there, I put all this in the background and let intuition guide me. But I go knowing that the story and the people I speak with will change as soon as I hit the ground. I find that the best people who can tell you about the country you are visiting are the people who live there—especially when you’re talking about how the culture responds to an outbreak. So I’ll meet with my source at CDC who I have lined up ahead of time, and I’ll listen to their take on the local culture. But a parking lot attendant outside of their hotel might be a more important source on this topic. Sierra Leone is a really safe country, and most people speak English in the capital, so I would just walk around the neighborhood where I was staying and strike up conversations. People are curious about me and I’m curious about them. Amanda Mascarelli: What safeguards did you put in place for your health and safety while you were reporting on Ebola? Amy Maxmen: I did my homework beforehand. I talked with infectious disease experts, and learned how Ebola spreads in the late stage of the illness and just after death, when viral levels are high and coming out of bodily fluids, in sweat, blood or diarrhea. That’s why health workers are at high risk. So I made the decision to not go into the “red zone” of Ebola treatment units. To do that I’d be wearing a Tyvek suit, and couldn’t have an interview with patients anyway. There was no point. Photographers were getting great shots, so I could imagine what it looked like. It wasn’t just my life I was worried about, but also if I got Ebola I’d be jeopardizing the time and safety of everyone who would have to deal with me after that point. In the early stage of Ebola, people don’t seem to be very infectious, but you still don’t want to risk it, so you don’t touch anyone. That’s not hard if you’re an outsider staying in your own room in a hotel, as I was. Another step I took was to hire a driver rather than take taxis, because a taxi might have been carting a person to the hospital just before you got in, or someone could hop in to share the ride. So when I met a person recommended to me by another journalist as a driver, and decided I liked and trusted him, we made a deal that I would pay a good fee and in return I would be the only person he drove around. Another key was to not get sick, just generally, because if I got a fever then I’d have to worry that I might have Ebola. So I got a flu shot. I took anti-malaria pills. I used hand sanitizer constantly. I was extra cautious about avoiding any food that might be contaminated. And I didn’t get sick. Beyond that, I felt free to walk around and talk with people. Amanda Mascarelli: When you’re reporting in the field, do you go home and translate your notes and jot out scenes? Or do you wait until you’re drafting a story? Tell me a little bit about your process. Amy Maxmen: If I’m being good, I go back to my room and write down the most memorable things. I have a file on everywhere I’ve been, titled something like “Diary from Sierra Leone.” And I just let myself be free-form with it. This helps me remember the most emotionally gripping situations. I also take a ton of photos with my iPhone and I’m not precious about it—I’m just snapping a shot so that I can jog my memory later. So I’m obsessive about downloading those, and then copying them onto a couple of USB sticks, along with the text file. This way, even if I don’t get to write a story for two months, I can go back and look at those pictures and my free-form diary and put myself back in that place. Amanda Mascarelli: I thought it was powerful the way the image of the health workers in the Tyvek suits kept recurring. Who were they? Were they a mixture of locals, or were they outsiders? Was there a strategic reason why you left that perspective out? Amy Maxmen: I don’t even know if it was intentional. But it works, because I wanted to convey how they were seen by people. Here’s a bizarre stranger, the opposite of who you’d want to see when you’re in mourning. They’re national, as in from the country. But sometimes they weren’t part of that community. They were usually hired by hospitals or NGOs. And I did talk to a lot of them. I guess there are no direct quotes because in the end you have to choose the most powerful quotes, and those weren’t them, at least for this piece. But I got information from them—like, for example, there’s an anecdote about how they would dress a corpse in a dress or they would put a necklace around them before they put them in the bag, if the family desired it. I did quote burial workers in another piece I wrote for Newsweek, and that directly addressed the main thing they complained to me about—a lack of payment. Amanda Mascarelli: You did a good job of avoiding characterizing the people there and their rituals as strange or different from “us.” Were there any cultural sensitivities that you had to be particularly attuned to while reporting and writing this? 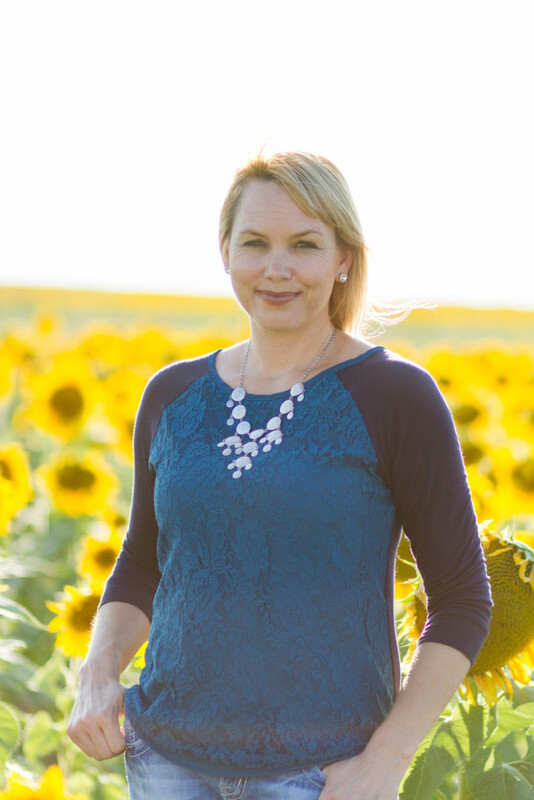 Amy Maxmen: Thanks! I feel like sensitivity comes from having in-depth conversations with people. It’s the only way I’d cover a story like this; you have to be there. Which is unfortunate because nobody has travel budgets anymore. But if I had just called Western NGOs and agencies like the CDC or the U.N., I would not have gotten the story. When you talk to people, and you start hearing their stories, they don’t seem so weird anymore. They usually make the same decisions you would in their circumstances. So you really need to be there, and to be fearless about talking to people. I find generally people like to talk about their lives. If I’m on a call with a scientist to talk about science, I keep it to 30 minutes. But if I’m asking somebody about something traumatic, I don’t limit that time. I might go to their house, or somewhere else where they’re comfortable. Amanda Mascarelli: Did you learn any major lessons while reporting this, or did it change the way you approach your reporting or writing? I didn’t realize that was wrong until I met up with one of the survivors again on other visits to Sierra Leone in February and June of 2015. One afternoon, this survivor told me that after he relived the experience while talking with me, he felt terrible for days and didn’t leave the house. I had no idea that I was causing this pain, and the only way to fix the situation now is to not repeat that mistake, and to share the story so that other journalists don’t do the same. What can be confusing is that the adults I interview want to share their experience because they want the world to know what they are going through. And it’s my duty as a journalist to collect the facts needed to be sure their stories are accurate. But now I have a new strategy that I hope lessens damage caused by conjuring up the past. If you interview someone about a traumatic experience, spend a good deal of time at the end of the interview talking about positive things in their life, the things that give them strength. For example, I just returned from Jordan, where I met with a number of Syrian refugees. One woman was in tears as she told me about how the Syrian regime had burned her son alive and had arrested and beaten another son. I tried to pivot by asking how she’s so resilient. She mentioned her husband, and I asked how they met, and then about the farm they lived on, and the cheese she made. We talked like this, and when I left we were kind of laughing. I need to give credit to my translator who really helped lighten the mood. There is nothing I can do to heal wounds like this, but at the very least I can try to not be a jerk. Amy Maxmen is an award-winning science journalist who covers the intersections of medicine, evolution, policy, and the public. Her stories appear in a variety of outlets, including National Geographic, Wired, and The New York Times. She is currently a senior reporter at Nature and is based in Berkeley, California. She was previously an editor at Nautilus. Prior to writing, she earned a Ph.D. in evolutionary biology from Harvard University. Her reporting from Ethiopia on the origin of humanity is anthologized in The Best American Science and Nature Writing 2015. And her National Geographic piece on death rituals during the Ebola crisis in West Africa won a 2016 Science and Society Award from the National Association of Science Writers. Maxmen’s photos from her trip can be found on Instagram @amaxmen. Follow her on Twitter @amymaxmen.